After the minimal differences between the last two pictures, I figured I should find one where there's only one thing unchanged, so I bring you the Times Square subway entrance near the northwest corner of West 41 Street and 7 Avenue. This is a corner that's undergone massive change in the past nineteen years. 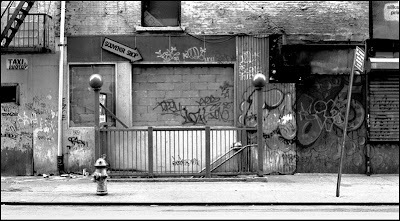 The original photo shows the closed storefronts of buildings that once stood on the north side of 41 Street, with the stairs to the subway in the center. During the 42 Street redevelopment of the 1990's, the entire western block of 7 Avenue between 41 and 42 Streets, was razed as far west as the walls of the New Amsterdam theater. 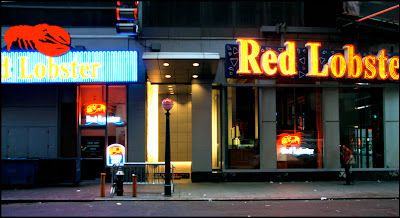 But they didn't do it just to build a Red Lobster; the restaurant is just one of many ground floor tenants of the 37 story Ernst and Young building at 582 7 Avenue. Who would have thought in 1988 that one day Times Square would have a neon-bedecked building for an...accounting firm? At any rate, the one thing I mentioned that's remained unchanged? The fire hydrant.